Skin conditions are very common – about 14% of consultations with GPs are for skin conditions. They can also be the cause of much frustration, worry and affect self-confidence. Cheshire Aesthetic Clinic’s IPL laser technology offers a long-term solution to many stubborn skin conditions for men and women of all ethnicities and skin types and is suitable for most areas of the face and body. We have particular expertise in treating sun damage and skin pigmentation, thread veins and acne. 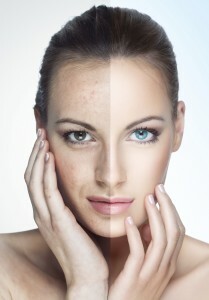 The demand for intense pulsed light (IPL) laser skincare treatments is at an all-time high. This is not surprising as traditional medication and treatments can be painful, ineffective and expensive! At Cheshire Aesthetic Clinic, we have chosen the industry-leading NRG ICE laser system – the only IPL system on the market that works on all skin colours and types. The built in ICE cold system ensures pain-free, speedy results from your course of treatments. We have chosen DermaPen™ as it prompts the natural release of the skin’s collagen and elastin for amazing anti-aging benefits, all without the need for surgery. It is the UK’s leading non-surgical skin regeneration treatment due to its effectiveness and safety. You can choose from Cheshire Aesthetic Clinic’s extensive range of IPL skin rejuvenation and DermaPen™ treatments which we recommend for fine line and wrinkle removal, thread veins, skin pigmentation, sun damaged skin, age spots, acne, acne scarring and most treatable skin conditions. Our expert therapist will advise you on the most effective treatment for your skin condition. Our skill and care will look after your needs, applying a dedicated course of treatment to leave your skin feeling smooth, soft and rejuvenated.